One of the great things about going to school in northern Michigan is the amount of pristine riverine habitat in the area. 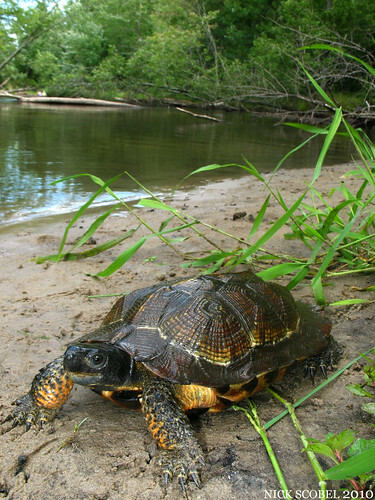 These habitats are home to the Wood Turtle, a Species of Special Concern in Michigan and a protected species throughout its range. 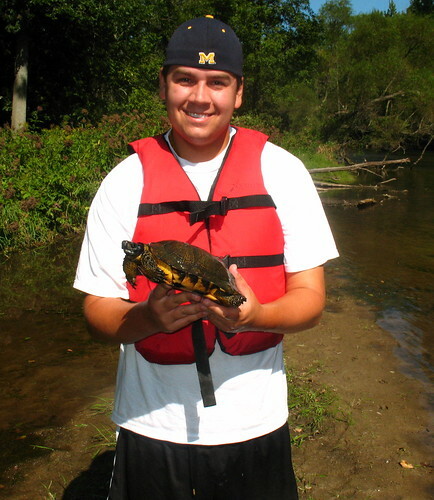 In Michigan, this species prefers small to medium sized rivers where a sandy or gravel bottom occurs. In addition, sandy banks and woodland habitats are also needed for nesting and foraging respectively. As the herp atlas project continues in Michigan, a few friends and I have taken the opportunity to identify strongholds of this species in some of Michigan's rivers. 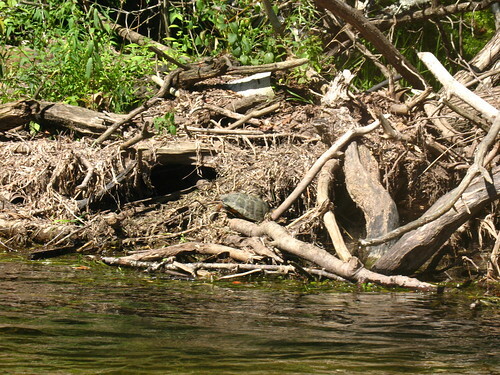 This section of river is a perfect example of perspective Wood Turte habitat. 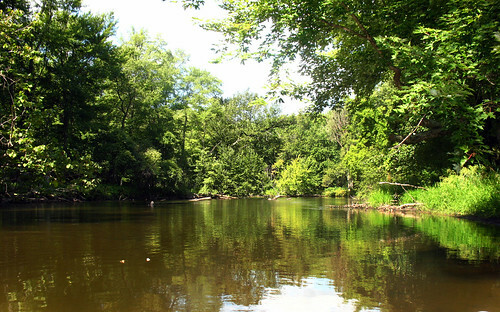 The river is surrounded by a large tract of mostly undeveloped woodlands, which is ideal. We found a place to drop in at and kayaked the river one quiet morning. The sun was out and the temperature was in the low 70s, we couldn't have asked for a better morning. 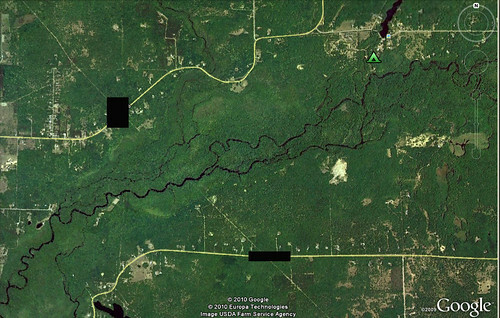 This particular river has a very sandy bottom and averages 2-3 feet in depth, with some pockets of 8-10 feet of water. There are plenty of sandy "beaches" along the switchbacks in the river which are great for nesting purposes. After about ten minutes, we spotted this. 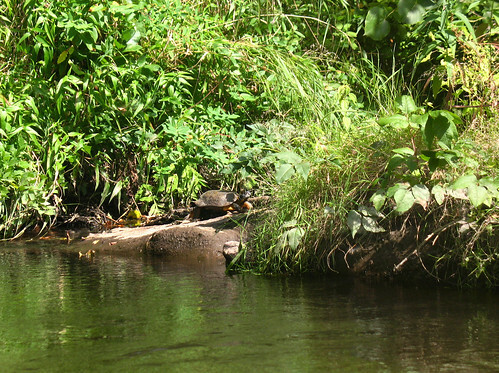 An adult male Wood Turtle found basking on a log jam on a cutback in the river. We were able to get a good look at him and snap a few shots. This individual was our first of five on the day. 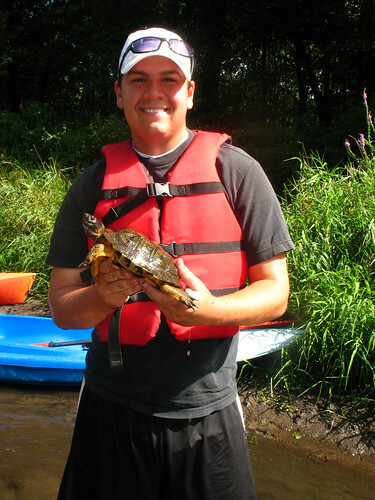 It appears that this river system is home to a rather healthy population of Wood Turtles as several juveniles were seen. Later on in the morning, we noticed a healthy adult female out on a mucky bank moving about, so we decided to get a better look at her. While taking a look at this girl. 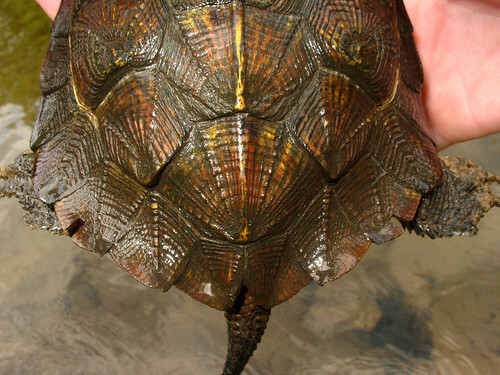 We noticed that some of her outer marginal scutes had been notched, indicating that this individual had been marked for a study. I'm not aware of anyone who's doing research on this particular river system, but I'll have to follow up with Jim Harding to be absolutely sure. We saw a few more Woods throughout the afternoon and enjoyed our trip. The next morning, my good friend Alex and I headed out to a different river system. 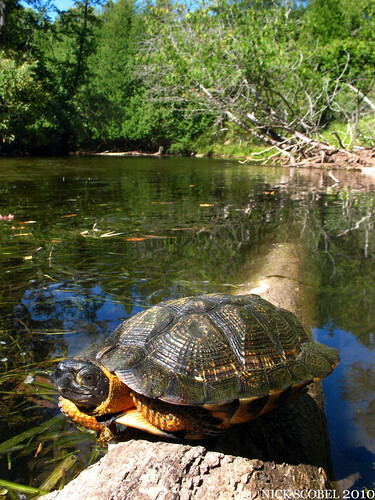 This river runs through some highly developed areas, but the upper branch is much more remote and holds some excellent Wood Turtle habitat. We concentrated on an 5 mile stretch of the river which is basically undeveloped. We'd seen Woods farther down stream, but we wanted to see how far upstream they occur. 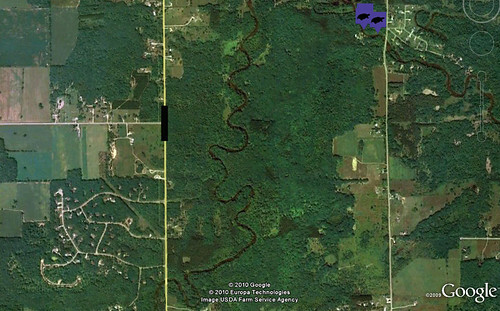 Here's an aerial of the section we decided to kayak. This river was a little different from the river we checked the day before. Instead of a purely sandy bottom, this river transition between sand, gravel, and a combination of both. 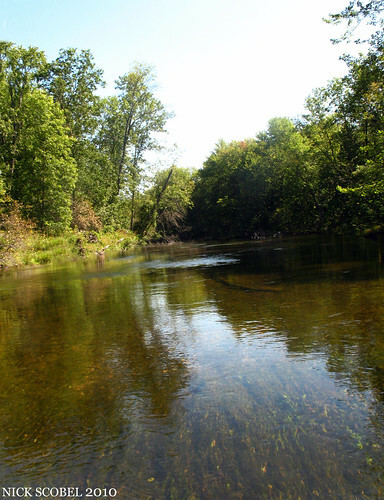 The river is also a great fishery for several trout species and Smallmouth Bass. 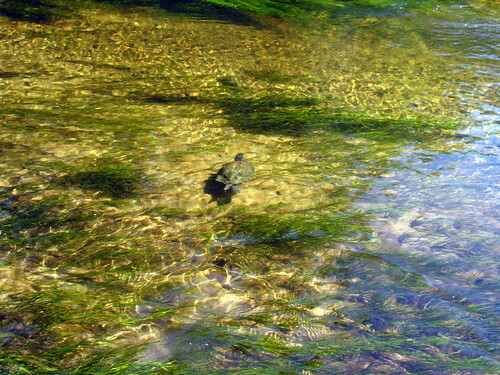 We dropped in around 11:30AM and within five minutes I spotted a large turtle near the bank of the river, sure enough it was our first of three Wood Turtles on the day. This large male was in absolutely perfect shape. We stopped him just for a few minutes to get a health check on him and to get a measurement or two. 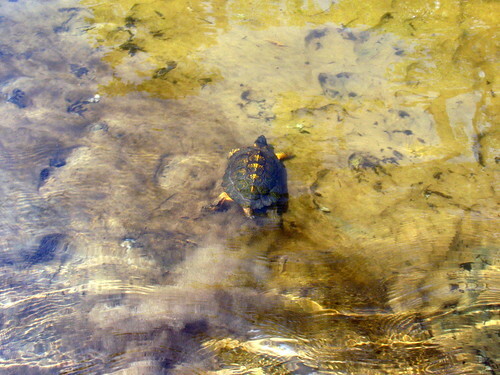 We let him on his way and jumped back into our kayaks and headed downstream. 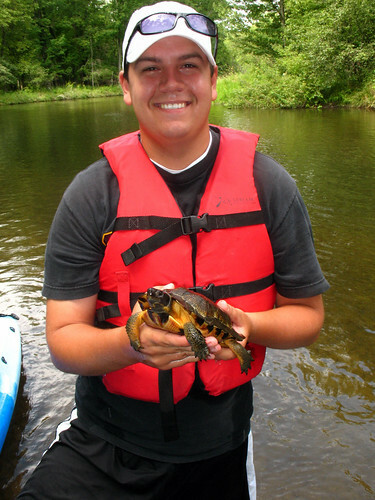 We were pretty excited that we had found a Wood Turtle so quickly and it wasn't more than ten minutes later when we struck gold again. Along this stretch of the river we made quite the spot. This Wood Turtle was basking next to a Northern Map Turtle & Blanding's Turtle. Unfortunately, the other two individuals escaped before I could snap a photo of the three species side by side. I was able to take a swim and sneak up on this small male though and secure him for a few photos. We ended up seeing a total of three Woods on the day and allowed us to gain more data points for this particular river system. The Herp Atlas project is still in need of ANY herp observations made in Michigan, so get out there and record what you find, when you find it. 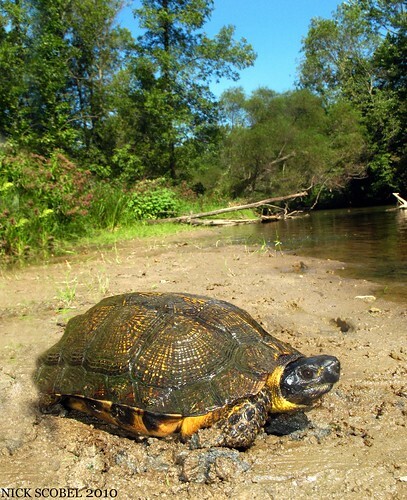 As with anything, our data collection on Wood Turtles will aid in understanding the distribution of this species in Michigan and help management of it in the future.